Where does it fit within Operational Excellence? LSS vs OE: Same Tools, Different Names? 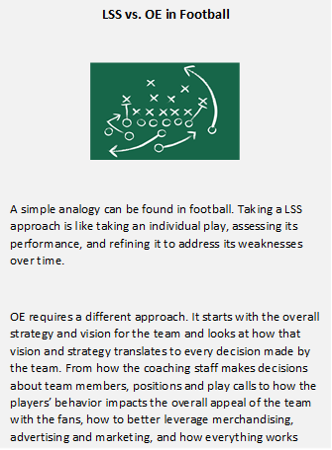 It is easy to see why many people see LSS and OE as essentially the same thing. On the surface, they have many similarities. They are both based on the same fundamental principles of taking a systematic approach to continuous improvement. They both result in standardization of processes, they both look to address risk and they both incorporate some aspect of culture that is necessary for success. From the outside looking in, they seem very similar, but this is where the similarities end. When you look at the scope of what they are seeking to accomplish and the specific approach they require, they are completely different. Overall, the key difference between the two is the scope of what they consider the “system”. With LSS, the system is usually a single process within the overall value chain, whereas Operational Excellence is not possible without looking at the entire organization as a system. LSS can work very well in the right conditions, but often it runs into two critical limitations. A LSS program can result in a world-class set of Standard Work Processes, but if any of the systems for hiring the right staff, for documenting the standards, for training or for rewarding workers for following the process are broken, the standards will not lead to sustainable improved performance. Any process within the business can have an indirect impact on seemingly unrelated processes. What can seem like waste within that process may be enabling agility or efficiency elsewhere. This is a natural limitation of bottom-up approaches like LSS, and even temporary improvements may lead to negative long-term impacts to the overall system. Operational Excellence requires a different approach – one that starts with the overall strategy and vision for the organization and ensures alignment across all decisions on how to meet that vision and execute the strategy. This includes aligning how the organization identifies, assesses and prioritizes risks, whether the risk is to product quality and customer value, to the overall growth targets of the business, to the health and safety of employees and stakeholders, to the environment, or to anything else that the organization values. 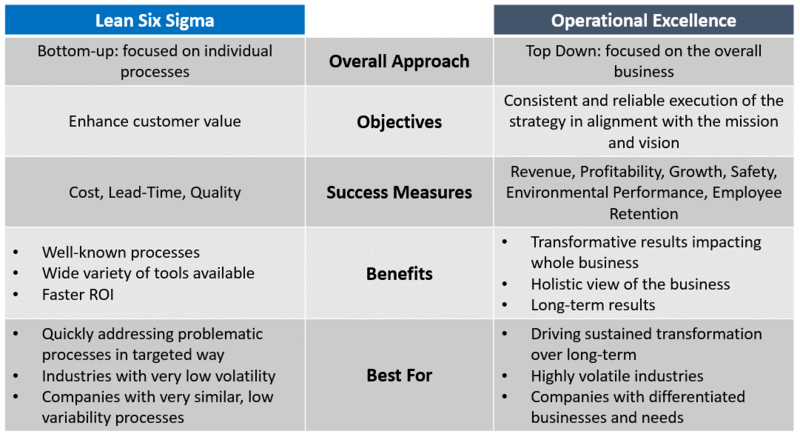 Lean Six Sigma and Operational Excellence are not the same thing, but they are also not incompatible. LSS has been proven to be successful in many applications, but it has several limitations absent something to align the broader organization. Operational Excellence can deliver tremendous sustained value by creating greater alignment across the organization, but it still relies on the proper application of tools like LSS to unlock value where needed. When LSS becomes a part of the overall journey toward Operational Excellence, the value of both programs is amplified.